After the IEEE ComSoc Webinar that I gave this month, there was a 15 minute online Q/A session. Unfortunately, there was not enough time for me to answer all the questions that I received, so I had to answer many of them afterwards. I have gathered ten questions and my answers below. I can also announce that I will give another Massive MIMO webinar in January 2018 and it will also be followed by a Q/A session. 1. What are the differences between 4G and 5G that will affect how Massive MIMO can be implemented? The channel estimation must be implemented in the right way (i.e., exploiting uplink pilots and channel reciprocity) to obtain sufficiently accurate channel state information (CSI) to perform spatial multiplexing of many users, otherwise the inter-user interference will eliminate most of the gains. Accurate CSI is hard to achieve within the 4G standard, although there are several Massive MIMO field trials for TDD LTE that show promising results. However, if 5G is designed properly, it will support Massive MIMO from scratch, while in 4G it will always be an add-on that must to adhere to the existing air interface. 2. How easy it is to deploy MIMO antennas on the current infrastructure? Generally speaking, we can reuse the current infrastructure when deploying Massive MIMO, which is why operators show much interest in the technology. You upgrade the radio base stations but keep the same backhaul infrastructure and core network. However, since Massive MIMO supports much higher data rates, some of the backhaul connections might also need to be upgraded to deliver these rates. 3. What are the most suitable channel models for Massive MIMO? I recommend the channel model that was developed in the MAMMOET project. It is a refinement of the COST 2100 model that takes particular phenomena of having large antenna arrays into account. Check out Deliverable D1.2 from that project. 4. For planar arrays, what is the height to width ratio that gives the highest performance? You typically need more antennas in the horizontal direction (width) than in the vertical direction (height), because the angular variations between users is larger in the horizontal domain. For example, the array might cover a horizontal sector of 120-180 degrees, while the users’ elevation angles might only differ by a few tens of degrees. This is the reason that 8-antenna LTE base stations use linear arrays in the horizontal direction. There is no optimal answer to the question. It depends on the deployment scenario. If you have high-rise buildings, users at different floors can have rather different elevation angles (it can differ up to 90 degrees) and you can benefit more from having many antennas in the vertical direction. If all users have almost the same elevation angle, it is preferable to have many antennas in the horizontal direction. These things are further discussed in Sections 7.3 and 7.4 in my new book. 5. What are the difficulties we face in deploying Massive MIMO in FDD systems? The difficulty is to acquire channel state information at the base station for the frequency band used in the downlink, since it is very resource-demanding to send downlink pilots from a large array; particularly, if you want to spatially multiplex many users. This is an important but challenging problem that researchers have been working on since the 1990s. You can read more about it in Myth 3 and the grand question in the paper Massive MIMO: ten myths and one grand question. 6. Do you believe that there is a value in coordinated resource allocation schemes for Massive MIMO? Yes, but the resource allocation in Massive MIMO is different from conventional systems. Scheduling might not be so important, since you can multiplex many users spatially, but pilot assignment and power allocation are important aspects that must be addressed. I refer to these things as spatial resource allocation. You can read more about this in Sections 7.1 and 7.2 in my new book, but as you can see from those sections, there are many open problems to be solved. 7. What is channel hardening and what implications does it have on the frequency allocation (in OFDMA networks, for example)? Channel hardening means that the effective channel after beamforming is almost constant so that the communication link behaves as if there is no small-scale fading. A consequence is that all frequency subcarriers provide almost the same channel quality to a user. Regarding channel assignment, since you can multiplex many tens of users spatially in Massive MIMO, you can assign the entire bandwidth (all subcarriers) to every user; there is no need to use OFDMA to allocate orthogonal frequency resources to the users. 8. Is it practical to estimate the channel for each subcarrier in an OFDM system? To limit the pilot overhead, you typically place pilots only on a small subset of the subcarriers. The distance between the pilots in the frequency domain can be selected based on how frequency-selective the channels are; if a user has L strong channel taps, it is sufficient to send pilots on L subcarriers, even if you many more subcarriers than that. Based on the received pilot signals, one can either estimate the channels on every subcarrier or estimate the channels on some of them and interpolate to get estimates on the remaining subcarriers. 9. How sensitive are the Massive MIMO spectral efficiency gains to TDD frame synchronization? If you consider an OFDM system, then timing synchronization mismatches that are smaller than the cyclic prefix can basically be ignored. This is the case in TDD LTE systems and will not change when considering Massive MIMO systems that are implemented using OFDM. However, the synchronization across cells will not be perfect. The implications are investigated in a recent paper. 10. How does the higher computational complexity and delay in Massive MIMO processing affect the system performance? I used to think that the computational complexity would be a bottleneck, but it turns out that it is not a big deal since all of the operations are standard (i.e., matrix multiplications and matrix inversions). For example, the circuit that was developed at Lund University shows that MIMO detection and precoding for a 20 MHz channel can be implemented very efficiently and only consumes a few mW. No, channel hardening requires rich scattering to appear, which is typically not present in mmWave bands. However, in mmWave communications you will probably have a strong line-of-sight component and therefore the channel is nearly deterministic from the beginning. I’m an RF engineer for a 1st tier wireless carrier in the US. Every year we have big music event that attracts over 150K fans. In the past we deployed temporary cell sites on the venue using multi-beam antennas (two 9-beam antennas) to cover the main stage area. Would this event be a good opportunity to deploy massive MIMO instead of the multi-beam antennas? 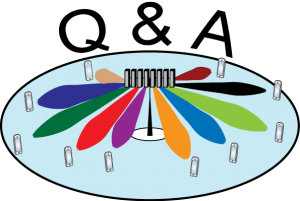 My concern is that I keep reading the main characteristic of massive MIMO is that the number of controllable antenna elements is much larger than the number of spatially multiplexed users. However, we expect our user bas will be in the several hundreds and our MIMO antennas are 32T32R.